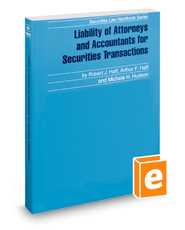 Minimize liability for securities transactions with this compact volume containing detailed, practical advice needed for ensuring compliance with all securities laws and regulations. Attorneys usually advise clients and prepare disclosure documents, contracts, and closing documents; handle the closing itself; and, sometimes, handle the preparation and issuance of formal legal opinions. Accountants may assist in the preparation (or limited review) of projections or of unaudited financial statements, but their principal role is to certify the financial statements. Significant and substantial liabilities may arise in connection with these various tasks. The book is principally organized around the different provisions of substantive law.